Community Attraction. 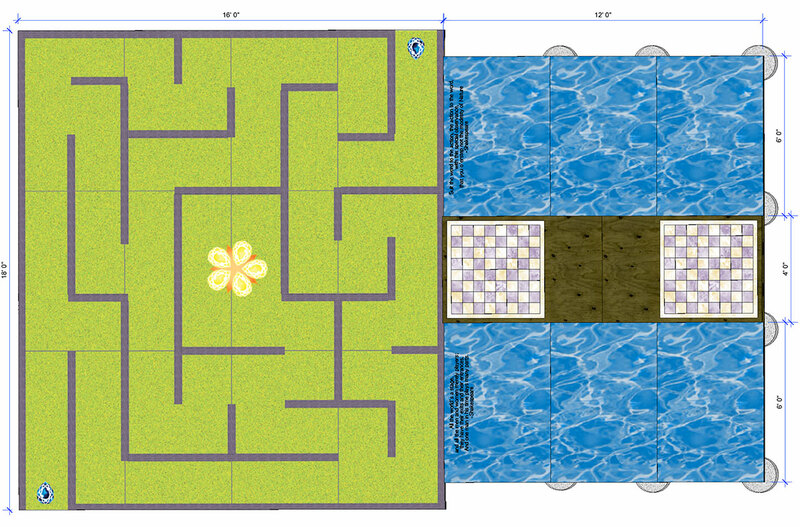 Multi-level, multi-purpose stages that are visually engaging and enjoyable with a giant maze, community table and chessboards with pieces. Events and workshops FREE to the PUBLIC. Theatre Game Nights, Garden Talks, Workshops on Presentation Skills, Reader’s Theatre, Yoga, community pitch-ins, and much more! Reserve the COMMUNITY STAGES for organizational meetings, family gatherings and other community events Preference given to Mapleton-Fall Creek businesses and residents. Send requests to mail@sapphiretheatre.com. 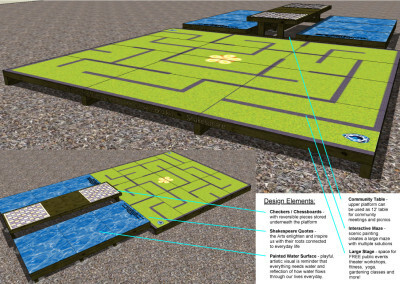 The COMMUNITY STAGES concept began as a seedling idea created at a Reconnecting To Our Waterways Creative Placemaking Workshop. From there, The Sapphire worked with Big Car to grow the concept. It quickly rooted and needed a ROW location to be planted. 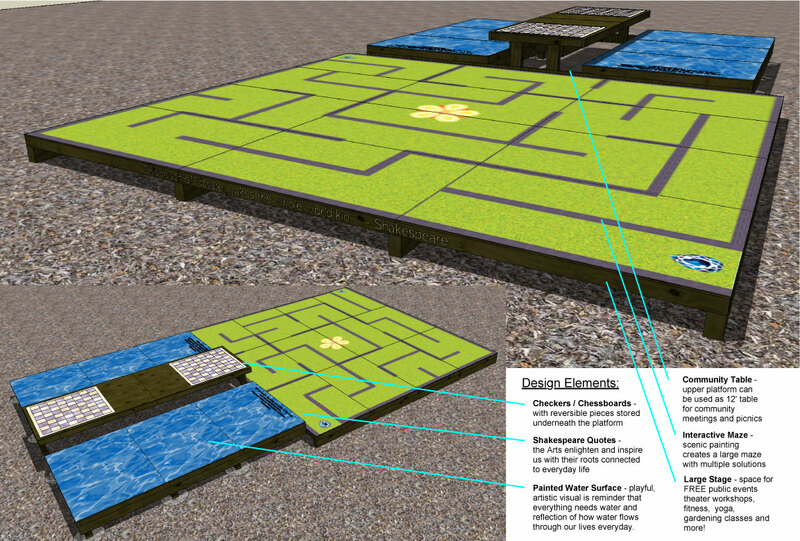 Fall Creek Gardens warmly welcomed the concept, offering their beautiful garden grounds for the COMMUNITY STAGES to grow. 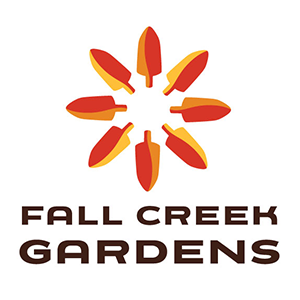 COMMUNITY STAGES at Fall Creek Gardens is a pilot for future projects. 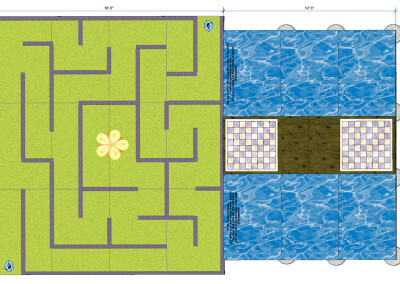 Fall Creek Gardens plans for COMMUNITY STAGES to evolve into a permanent, programmed attraction. 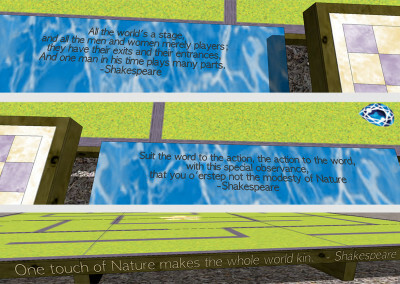 Sapphire and Big Car plan to bring COMMUNITY STAGES to other ROW locations. The Sapphire Theatre Co. has been performing arts with purpose in Indy since 2008. 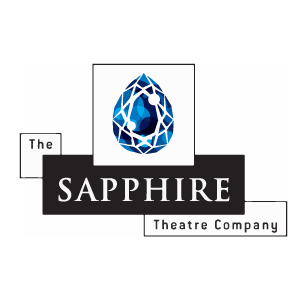 The Sapphire is a mobile, innovative arts and entertainment company offering Performances and Events, Programs for Schools and Corporations, and Production Design + Fabrication Services. COMMUNITY STAGES is one more way we are living our mission to entertain, inspire and connect in order to enrich the human spirit and contribute to Indy’s cultural growth. Big Car Collaborative is a collective of artists, formed in 2004, that focuses on creative placemaking and socially engaged art. As an adaptive and flexible cultural organization, Big Car draws together people of all backgrounds to promote and perpetuate creativity, invigorate public places, and support better neighborhoods. 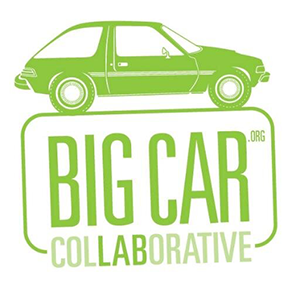 Big Car is a creative community builder working to boost livability from an engagement-based arts perspective. Fall Creek Gardens is a resource center for anyone interested in growing food in the city on a budget. From a pot of lettuce in a windowsill to a small flock of chickens in the backyard, we believe that homegrown food not only tastes best, but also builds healthier people, environments, and communities. It is our mission to empower home and urban food growers by practicing and teaching organic and sustainable methods, promoting community gardens, and providing access to resources. Reconnecting to Our Waterways (ROW) is a grassroots initiative designed to catalyze and bundle neighborhood quality-of-life initiatives, neighborhoods assets, and opportunity for residents living in disadvantaged neighborhoods. The goal is to enrich the livability of Indianapolis and the well-being of residents by generating new and sustainable opportunities to learn about and experience art, nature, and beauty along targeted natural waterways and the neighborhoods around them. 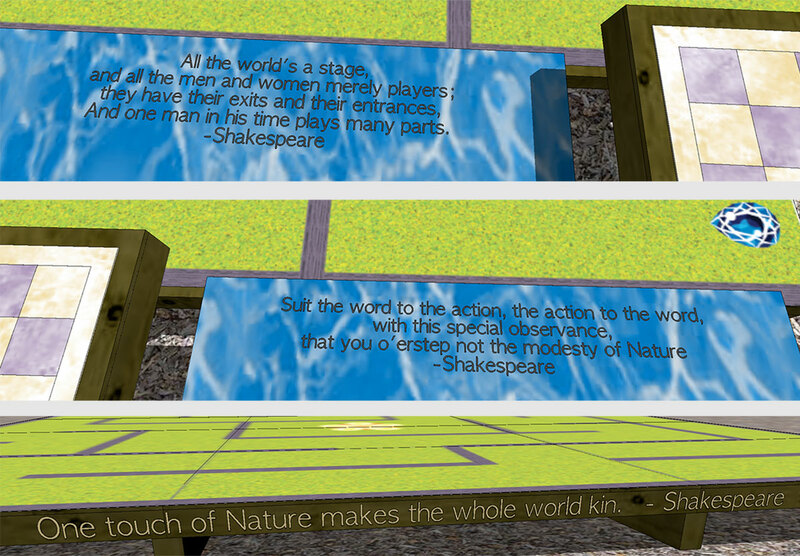 The mission of the Sapphire Theatre Company is to produce professional theatre that entertains, inspires and connects in order to enrich the human spirit, compensate artists for their talents and contribute to cultural growth. Established in downtown Indianapolis in 2008. We are a 501(c)(3) non-profit organization.